On Tuesday, October 2nd, Linden Lab announced the seasonal re-opening of the Haunted Halloween Tour together with a further Premium member’s gift. Now in its fifth iteration since being unveiled in 2014, the Haunted Halloween Tour is an experience-led ride through (and under) an old house that echoes the Bates residence from psycho (I’m still surprised there isn’t a trip through a bathroom somewhere along it). Reached via either Portal Park 1 or Portal Park 2, this latest take on the tour keeps the house, the usual coffin “cars” to ride in, and takes a familiar route through the house. But, as with previous years, there are a fair few new tweaks and changes to things. As the Tour is experience-led, those wanting to try it will have to accept the experience prior to passing through the Tour’s portal at either of the Portal Parks. This sometimes causes concern, partially due to the large dialogue that is displayed by experiences which indicates control of some aspects of the user’s viewer will be taken (see right). There’s actually no reason to fear these dialogues: they are there to inform users over what is likely to happen and offer reassurance that it is all correct and proper (although admittedly, the dialogues could perhaps be made to be a little less threatening). And at the end of the ride, all permissions are automatically revoked until the next time you join the Tour. 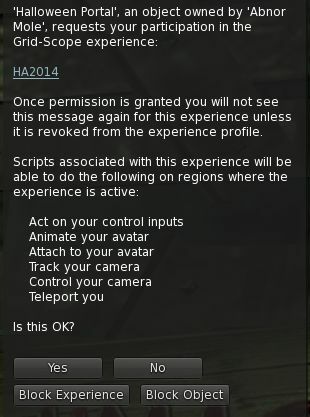 However, if there are lingering concerns after taking the ride, the permissions can always be manually revoked – just go to the Avatar / Me menu (viewer 5+), selected Experiences, locate HA2014 in the list, click on it and select Forget. Should you do this, you will have to re-allow the experience on your next visit to the Tour. I’m not going to dwell on the tour too much – there are new wrinkles, as noted. What I will say is that since 2015 and the first return of the Tour, I’ve tended to find it perhaps a touch too long, running for about 15 minutes. This variant is roughly the same length, but I (mostly) didn’t feel as if time was dragging as I have done with past iterations. The Premium Gift comprises a camp site with tent, open fire and logs set around it for seating, the basics of the camp might suit any number of locations. The Halloween element comes with the inclusion of a spooky tree, pumpkins and grave stones. The entire LI for the set is 85, but this can be reduced by only rezzing the items you require – so, for example, the tent, fire and seating could be used year-round, as the pumpkins could be removed. The gift is supplied with a rezzer in the form of a radio on a tree stump, which will also “read” stories in chat – one story is supplied and more can be added, if desired. I’m admittedly not a great fan of this type of Premium Gift – I much prefer practical benefits, vis more group slots, etc.). 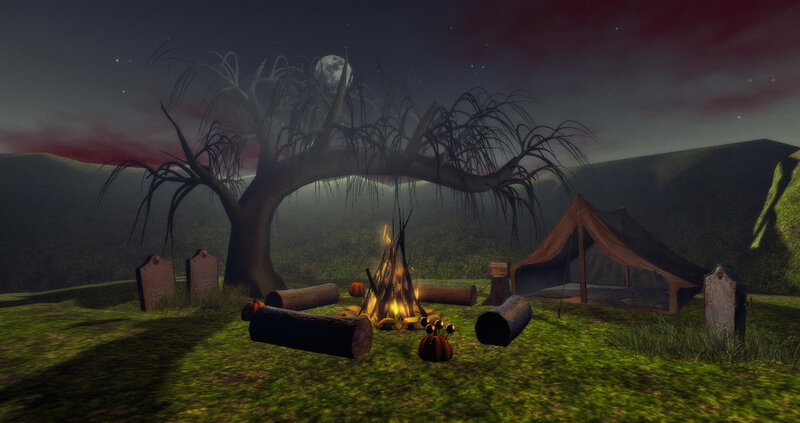 However, high LI aside (when compared to other mesh camp sets), some could find this one has use well beyond the Halloween season, although the static animations might be seen as a little limiting. Premium gifts can be collected from any of the kiosks located in the Premium sandboxes.